Our robotic lawn mower reviews compare the best robot lawn mowers, roomba lawn mower, and remote control lawn mower. 4 What is the Best Robot Mower on the Market? 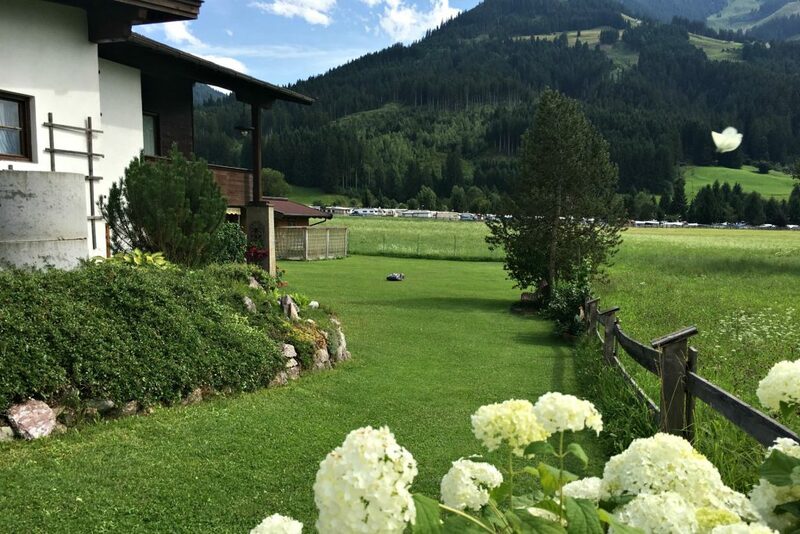 We are in Austria right now and I am amazed at how many robotic lawn mowers I have seen in this little Tyrolean town. Efficiency at its finest, I suppose. I’ve mostly noticed the Husqvarna Automower, but it isn’t the only robot mower I’ve seen. So, is a robot lawnmower for real? It is! The future is here. Whether you call it a lawn Roomba, a robo mower, a lawn bot, a lawn robot, or a mowbot, these cool lawn mowers can take care of your yard, so you don’t have to. A lawn mower robot is a lot like a yard Roomba, you know—those vacuum cleaners manufactured by iRobot. It’s an automated, self-navigating floor cleaner. While there isn’t an iRobot mower, there are a bunch of automatic mowers that operate the same way. Robotic lawn mowers run on a rechargeable battery and scurry around your yard clipping grass on a schedule you set. A low voltage “fence” is included and you’ll need to tack it down around the perimeter of the yard you want mowed. If a remote lawn mower runs into anything, it stops and turns around. When it needs to recharge or it starts raining (most mowers), an automower will return to its base. Of course there are always pros and cons to technology. 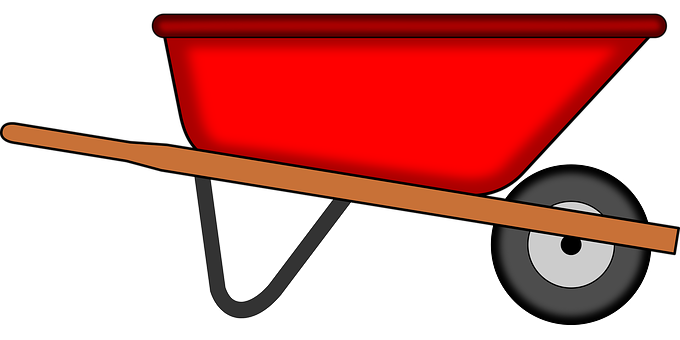 Check out my list to see if a self mowing lawn mower is for you. A robot does the work for you. Once it is set up, the mower runs on autopilot. Drone lawn mowers maintain a tidy lawn. They do a good job covering the area you program them to cover. A mower robot is quiet. You can mow the lawn at night without bothering your neighbors. It’s super cool to have a robot mowing your lawn while you sit back and sip a beer. There is set up time involved. You will need to lie out the perimeter wire and program the Roomba lawnmower. While robot lawn mowers do a pretty good job, there may be some edging that needs to be taken care of with a string trimmer. If you are a fan of parallel lines, this isn’t the mower for you. Robot mowers run in random pattern. They won’t work on yards over 3/4 acre or so. Robot lawn mowers are expensive. Mowing Area – the size lawn the robot mower covers. Cutting Width – how wide a swatch the mower cuts. Cut Height – the height range you can have your grass mowed to. Max Slope – how steep an incline and decline the mower can handle. If you think a robot mower is right for you, keep reading to see my robotic lawn mower reviews and choose the specific one that’s best for your lawn. Not interested in a robotic lawn mower? See my guide to the best lawn mower for reviews of gas mowers, electric mowers, and riding mowers. What is the Best Robot Mower on the Market? Husqvarna automatic lawn mower gets my vote for the best robotic lawn mower with their newer autonomous lawn mower the Automower 450X. Like the other Husqvarna robotic lawn mower, the 450X is a powerful mower that keeps the lawn short and tidy while its owner is off doing other things. 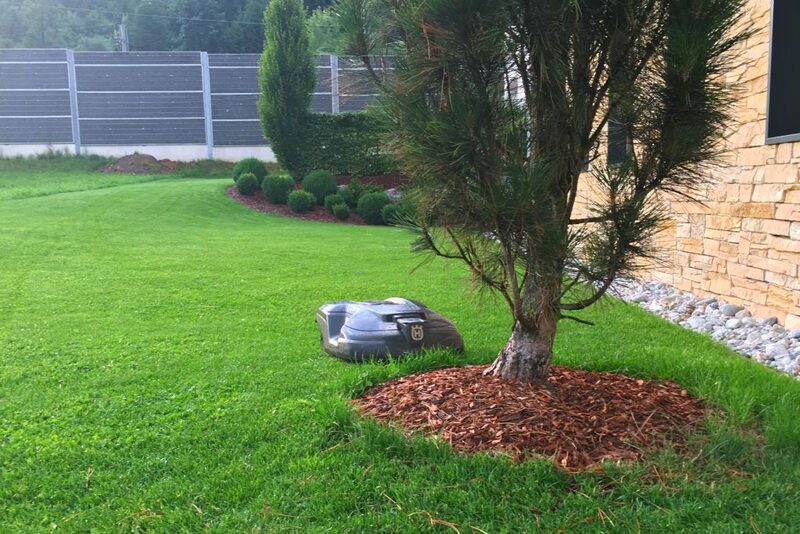 The Husqvarna robotic lawn mower 450X can mow a larger yard – up to 1.25 acres. Don’t worry if your yard isn’t a perfect square, the Husqvarna robotic mower has GPS navigation to help it manage complex yards. You can program multiple zones for the mower to manage. Your yard isn’t flat, either? The 450X nimbly climbs and descends slopes up to 25-degrees. The three pivoting blades cut from all directions, which helps prevent mold and gives the lawn a nice, clean-cut look. One of the best features of this robot mower is that it adapts its mowing length to the growth pattern of your lawn. It uses the GPS to create a map of your lawn and adjusts its pattern to mow the lawn evenly. 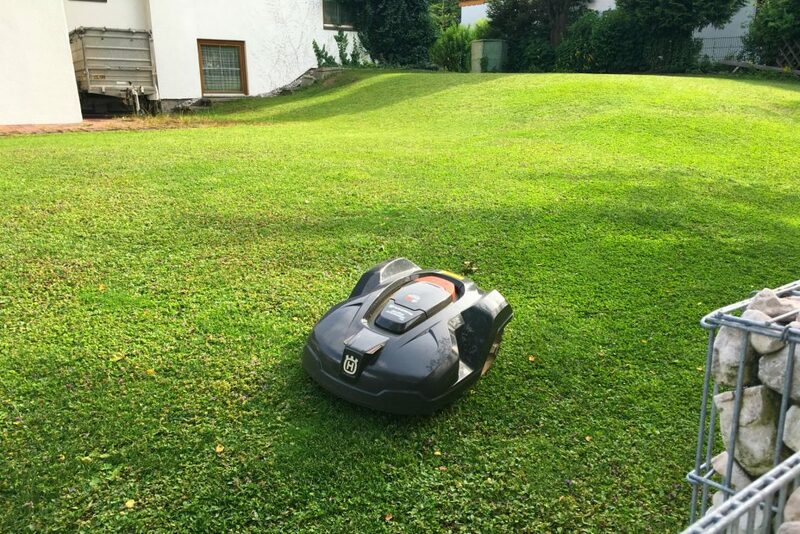 If the Husqvarna Automower needs to run through a small opening to get from one section of the lawn to another repeatedly, it won’t scalp that area. This is truly a smart mower. The Husq mower will return to the charger when the battery gets low or when the weather gets too bad, but it does mow in the rain. You can program the mower on the mower itself, or use Husqvarna’s Automower® Connect app (sold separately, of course) on your smart phone. For safety’s sake, you can program in a PIN that you will need to enter if the anti-theft alarm is sounded when the lawnmower leaves the perimeter you set. 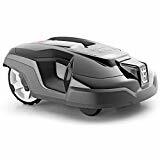 Click through to buy or check theHusqvarna Automower price or scroll down to read more robot mower reviews including the Automower review of the 315 auto mower by Husqvarna. You’ve seen what I consider the best robot mower on the market, but maybe it’s not the best for your needs. Once you’ve looked over the comparison chart, it’s time to dig a little deeper into these top rated robot lawn mowers and decide which “Roomba for lawn” you want. Click through any photo or link to see the robot lawn mower price, they fluctuate just enough that I can’t keep up with exact prices here. If you read the Husqvarna Automower review above, you’ll see a lot of similarities between the 450X and the 315. One of the biggest differences is that the Husqvarna robotic lawn mower 315 only covers .37 acre or 16,000 square feet. Fortunately, that’s plenty of coverage for most homeowners. Like its big brother, this Husqvarna lawn mower robot is made for complex yards, handles slopes and rough yards, and adapts to your lawn’s variable growth rates. The Husqvarna robot can use a separate “guide” wire to take a shortcut across the lawn, making it more efficient than robot mowers that simply follow the perimeter wire back to the base. Or you can purchase the Automower Connect and run that puppy from your smart phone, turning it into a Husqvarna remote control lawn mower. You set up how you would like the Husqvarna automatic mower to do your lawn and then sit back and let it cut. It is made to gently bump into things, so you don’t have to set the perimeter wire around every tree or obstacle in the yard. What would you add to this Husqvarna robotic mower review? You can read my other Worx Landroid review in my overall lawnmower guide, but I will add some detail here. The Worx robotic lawn mower is one of the best robot lawn mowers out there. Like the Husqvarna Auto Mower, the Worx robot mower is meant to gently bump into things and then turn, so you don’t need to lay the perimeter wire around everything—just the outer perimeter of your yard. The shock sensor system allows it to mow around objects like bushes and larger toys left in the yard (is something is smaller than the mower, it will run right over the top of it). The Landroid robotic lawn mower will return to its base when it needs to charge the battery and when it rains. It cuts evenly and intricately and can handles inclines up to 20 degrees. The built in security system ensures the WORX robot lawn mower is safe in your yard. It has a PIN enabled lock and an alarm system. It also has a shut off safety feature when it is picked up. Because it comes programmed and ready to use, the Worx lawn mower robot is really easy. You still have to lay out the perimeter fence, of course, but you don’t have to figure out the computer. And the interface is quite intuitive. This robot worx! The Landroid mower is good for navigating small and narrow places. And your Worx lawn mower robot won’t go obsolete because you can simply download software updates to keep it up to speed. The ROB automatic lawn mower has many of the same features as other mowers in this robot lawn mower review. It cuts well and maintains a tidy lawn. You program the mower to mow the lawn when you want. There is an audible alarm that can be heard even within the house if someone tries to steal your robotic mower. The alarm can only be disarmed with a PIN code. The lift sensor and tilt sensor will stop the blades when either of those things happen. Cons: Small cutting swath and doesn’t handle as much slope as some of the other mowers. Robomow makes not just one autonomous mower, but three different models in the RS series alone. The big difference between the three is the size of lawn they cover. This Robomow review will cover the three Robomows in the RS series with the various mowing areas listed in the stats below. The Robomow RS630 is a robotic lawn mower for large lawns while the RS612 is meant for smaller lawns. The Robomow comes with an install kit, no need to purchase separately. It has a sensor for cold weather, rain, and low battery, and will return to the charging station in any of those instances. The triangular blades extend the edge of the robotic mower, so it cuts a wide swath. It can handle rough grass and is good for the first cut of the season. You can turn it into a remote control lawn mower by using the app on your phone to direct it or just program it and let it go. You can program several different zones and mow each one separately. There is a child lock/theft lock system that doesn’t allow anyone other than you to operate the Robomow robot mower, or anyone without the PIN code. This remote control mower will allow you to program and set the mowing program day, time, zone and duration. The mower uses razor blades to cut the grass, rather than a steel blade. The cutting action (versus a tearing action), gives the lawn a cleaner cut and dew or moisture on the grass won’t get into the motor. Mows for 2-3 hours on one charge. 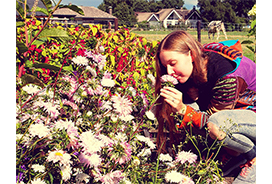 Want to find out what is the best lawn mower? Check out our best lawn mower reviews for reviews on riding, gas, and electric lawn mowers. 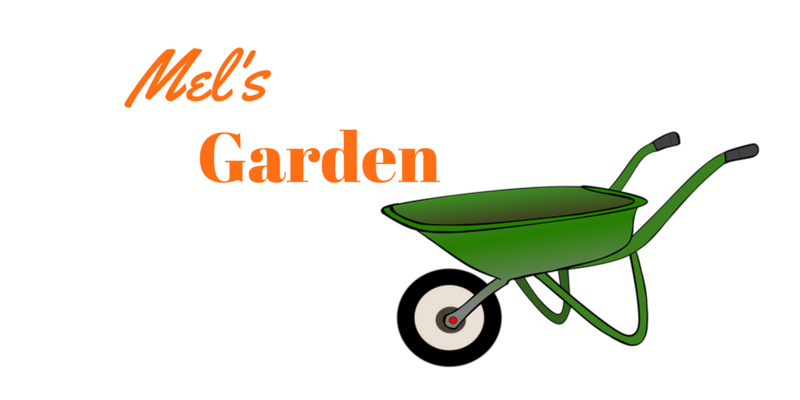 And see my blog for lawn care and mowing tips.